The largest simulation of the cosmos ever run has boldly taken us where we have never gone before: the formation of the universe. 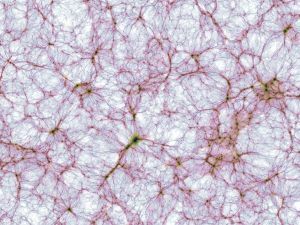 Illustris: The Next Generation (IllustrisTNG) utilized new computational methods to achieve a first of its kind universe-scale simulation. The data-packed simulation has already fueled three papers, which were published Thursday, Feb 1, in the Monthly Notices of the Royal Astronomical Society. The insights gleaned from the simulation have given researchers a new understanding of how black holes affect the distribution of the ever-elusive dark matter throughout galaxies. Not only could these powerful gravity wells be preventing older galaxies from producing new stars, they could also be influencing the emergence of cosmic structures. IllustrisTNG made these predictions by modeling the evolution of millions of galaxies in a representative region of a universe. The cube-shaped area has sides that are nearly 1 billion light-years long. In the previous version (called Illustris), the model area’s sides were only 350 million light-years long. The updated program also introduced some crucial physical processes that had not been included in previous simulations. These updated features allowed IllustrisTNG to model a universe remarkably similar to our own. For the first time, the clustering patterns of the simulated galaxies demonstrated a high degree of realism in comparison to the patterns we see from powerful telescopes, such as those at the Sloan Digital Sky Survey. If the program’s verifiable predictions about dark matter, galaxy formation, and magnetic fields continue to prove accurate, we’ll be able to put greater stock in the insights it provides about processes we haven’t been able to observe with even the most advanced telescopes. By mapping out the histories of model galaxies, we may get a glimpse of what the Milky Way looked like as Earth came into being. We could even get an idea of how our galaxy might evolve billions of years from now. In the years to come, this simulation might prompt some astronomers to simply adjust their telescopes to look for newly predicted stellar processes. For example, the simulation of the cosmos predicted that galaxy collisions that form larger galaxies should produce faint stellar light. Specific details about where to look for this background glow could allow astronomers to confirm their theories about these intergalactic events.